April 3, 2018: I listened to two conference calls in succession with Israeli journalists, mainly on the Gaza situation: The first was with Haviv Rettig Gur, a correspondent and analyst for the Times of Israel, in a “webinar” hosted by the Jewish Council for Public Affairs (JCPA). The second was the Israel Policy Forum (IPF) in conversation with Alon Ben-David, senior military correspondent for Israel’s Hadashot 10 TV network. Politically, I’d describe Gur as moderately liberal and Ben-David as perhaps more centrist, but neither as particularly ideological; both are concerned with reporting on events as they see them. Gur’s talk (in excellent English) was especially informative; these are his observations: Neither Fatah nor Hamas is popular, and neither is democratic. Polls show each losing elections to the other in the jurisdictions where they rule — Hamas losing to Fatah in Gaza and Fatah losing to Hamas in the West Bank. Hamas has established a tight dictatorship in Gaza, and Abbas is now in the 12th year of a four-year term. Hamas is boxed in by Israel and Egypt, with the Palestinian Authority under Fatah cutting off funding for public payrolls, which kept Gaza functioning economically by paying salaries to many Gazans for non-jobs. Israel is succeeding in destroying border tunnels and Hamas has been at war with the Egyptian army since 2014. The massive border demonstrations is a new Hamas strategy to keep itself in power. It’s the beginning of a six-week campaign building past Israeli independence day and into “Nakba Day” in mid-May, even as the people of Gaza are suffering from increasing economic privation. Bizarrely, Gaza is still so completely dependent on Israel that the Israeli shekel remains its basic currency. Hamas’s rhetoric remains violently anti-Israel, with Hamas media announcing to Israelis in Hebrew that the demonstrators are intending to cross the border in order to kill them. Hence, although there is little danger to most Israelis, they feel threatened. Asked if there could be similar massive demonstrations pressing against the borders of the West Bank, Gur said no, because the Palestinian Authority is incompetent. He even suggested that if such demos were organized under peaceful auspices, that many Israelis would welcome them. By way of support, he reminded his audience that Rabin was elected in 1992 with the explicit pledge to end the occupation. Given the provocation of 20-30,000 angry demonstrators marching on the border fence, Gur does not see the 16 demonstrators killed by Israeli soldiers as indicative of a general mishandling of the situation. For one thing, he discounted from among the dead, the five to ten identified as Hamas operatives; beyond this, he cited the 700 reported to have been injured by gunfire as indicative that the soldiers were trying not to shoot to kill. (Still, it’s hard for us at this remove to know if live fire was necessary at all.) In general, he sees Israel’s action as “just,” with the possibility that some individual soldiers acted wrongly. He looked soberly at the international political consequences, noting the paradox that every Palestinian victim is a blow to Israel and helps Hamas. Asked about Netanyahu’s flip within hours of the agreement with the UN announced on Monday to allow about half of 30,000 African asylum seekers to remain in Israel, with about half to go to other Western countries and not be repatriated to uncertain fates in Africa, Gur saw Netanyahu as predictably showing a complete lack of moral courage. Netanyahu had negotiated this aborted deal alone, and lacked the spine to stick with it as a principled leader would. The deal was immediately attacked by his coalition partners Naftali Bennett and Moshe Kochlon. This threatened Netanyahu’s usual election strategy to play to his right to outflank Bennett, and thereby stave off Yair Lapid from possibly outpolling Likud with his Yesh Atid party and thereby getting a first crack at forming a new government. Netanyahu’s government doesn’t want to do what both Israeli and international law demands, which is to review the asylum claims of all the African refugees, because if found to be valid, they’d have the right to stay. As for the corruption charges looming against Netanyahu, he sees him most vulnerable legally to the one involving his time as communications minister, because a key aide is willing to testify for the prosecution. Most Israelis see Netanyahu, a millionaire, as personally corrupt and greedy, but can’t imagine a viable alternative as prime minister because they trust him on security issues. This supplements the foregoing with additional observations made by Ben-David in his conversation with the Israel Policy Forum (listen by clicking here). He gives Hamas credit for having not fired a single rocket or even a bullet at Israel since August 2014, and for attempting to crack down on other factions attacking Israel. Yet Hamas is attempting a new strategy now. He sees the Hamas campaign as escalating tensions every Friday for the next weeks. Things are so bad for Gazans that in contrast with prior demonstrations, women and children do not have to be paid to be bussed to confront the border fence. And hunger is so common that he reports that children have penetrated the fence to be jailed in Israel, in order to get three regular meals a day. At the same time, there is an economic incentive for Palestinians to become “martyrs” in order to get their families pensions. Ben-David mentioned the IDF using these non-lethal means of crowd control: teargas, chemical spray, noise blasters and rubber bullets, trying to enforce a 300-meter threshold distance from the border fence. He expects sniper fire to be kept to a minimum with each IDF sharpshooter closely supervised by high-ranking officers. Still, the danger of a possible spillover of violence in and from the West Bank (or East Jerusalem) is real, especially if women and children are killed. Ben-David criticizes the government for not working on a coherent policy beyond security. He envisions an alternative possibility of outside parties, especially from the Arab world, upgrading Gaza’s economy. For example, he sees it as in Israel’s interest for a seaport to be built on the Gaza coast, and claims that six current government ministers support this idea, largely because it would move Gaza to be independent of the West Bank. This comports with Bennett’s Bayit Hayehudi (Jewish Home) party’s wish to annex most of the West Bank. While not endorsing Bennett’s program, Ben-David admits to seeing a de facto three-state solution as making the most sense. Hamas governs Gaza (albeit badly) as a separate state and he does not see anyone replacing it. At the same time, he named a number of Palestinians (unknown to me) as good replacements for Abbas, now in his 80s and reportedly ailing. A veteran editor, freelance writer and blogger, I edited the print magazine, "Israel Horizons," from 2003 until 2011; and I regularly blogged for and edited the Meretz USA (now Partners for Progressive Israel) Blog since its inception in 2006 until 2015. I've been an active supporter of the Zionist peace camp since 1982. Other print and online platforms where I've been published include: The Forward, Tikkun, The Daily Beast, In These Times, Jewish Week, New Jersey Jewish News, Jewish Currents, Huffington Post, Dissent. Thanks for the additional information about Hamas media announcing to Israelis in Hebrew that the demonstrators are intending to cross the border in order to kill them. 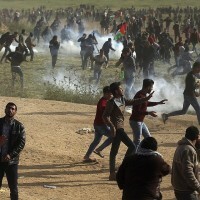 I’m getting really pissed off by the reporting on the Gaza conflict at the moment which stresses “peaceful protests” and says or implies that the Israelis are simply murderers for shooting men with slings (“throwing stones”) and Molotov cocktails. The sling is mentioned by Homer and by other Greek authors. Xenophon in his history of the retreat of the Ten Thousand, 401 BC, relates that the Greeks suffered severely from the slingers in the army of Artaxerxes II of Persia—and these were armored hoplites who took those severe losses. So men like the ones pictured here (well this web site won’t let me include the photos from the NYTimes & others) are not “unarmed demonstrators,” they are not even rioters, they are armed combatants engaged in combat and if they get shot they are battlefield casualties—not innocent victims of brutal oppressors.